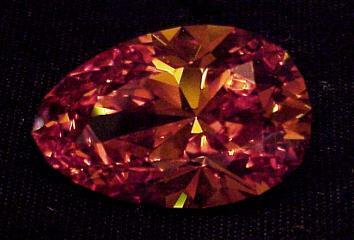 In the summer of 1963, a 198.28-carat fancy brown diamond was found in the South African diamond fields. This unusual stone was purchased by Julius Cohen, New York City manufacturing jeweler, under whose direction it was fashioned by the firm of S & M Kaufman into a Fancy Orange-Brown 104.16-carat pear shape. The stone has a total of 189 facets (67 on the crown, 65 vertical facetrs along the girdle, and 57 on the pavilion) and measures 24.98 mm wide, 39.10 mm long, and 16.00 mm deep. It has a depth of 64.1% and a table of 44%. 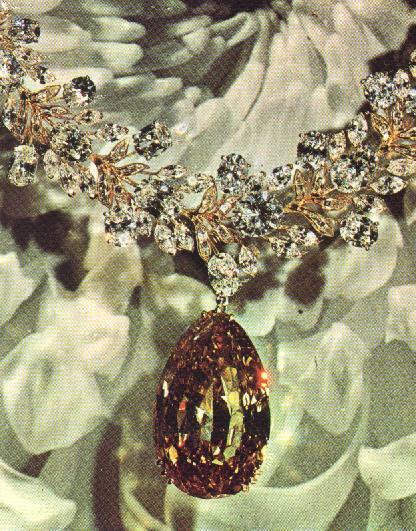 It was mounted as the central stone in a yellow gold necklace of 410 oval and marquise-shaped diamonds. The Great Chrysanthemum as seen in GIA's Diamonds - Famous, Notable and Unique. Photo © Julius Cohen Inc. 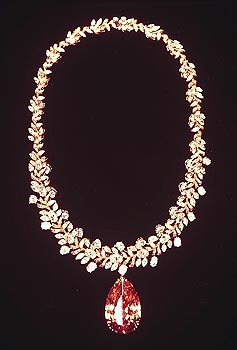 The Great Chrysanthemum has been exhibited by several retail jewelers in the United States and was shown as a Diamonds International Awards winner in 1965. In the same year, it was displayed at the Rand Easter Festival in Johannesburg, South Africa. Julius Cohen later sold to it an unknown foreign buyer. The diamond is currently owned by Garrard's of London. Sources: Diamonds - Famous, Notable and Unique by Lawrence Copeland (GIA), private sources. A replica of the Great Chrysanthemum Diamond cut from cubic zirconium. The stone was cut by Hubert Rackets of the Texas Faceters Guild. Photo © Hubert Rackets and respective guild.